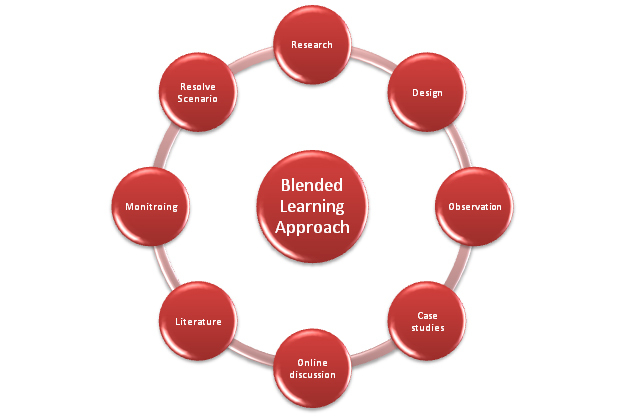 Blended learning is to build an interactive & efficient hybrid learning environment with technology support for carrying teaching & learning activity under an active learning atmosphere to encourage students becoming an active learner outside classroom. By employing virtual learning environment - Second Life in assisting students’ learning, our team would like to (a) arouse students’ interest in some of the topics which may sound boring through traditional learning, (b) help them to gain knowledge they needed in a more effective way, (c) provide more chances for students to practice their adapted skill and knowledge, and hopefully to (d) help them exploring their potential ability. Students may find difficulties and defeat by fail during their learning process, this may trapped them in “Unconscious Incompetence”, we try to design new style of learning activity to arouse their interest and motivate them become an active learner through “fun” & “interactive” learning. With the trend of fun learning, digital game based method is employed in the new generation of education. The major idea is to make fun in learning instead of just a “job”; this can definitely strengthen the leaning motivation which can then increase the learning effectiveness. According to the survey, we tried to evaluate outcome of our activities carried out by studying students’ rate of interest in learning. With a marked effect, we found around 60% of the participated students have a high rate of interest in their virtual learning experience and more than 70% of them agreed that the learning activities are helpful in arousing their learning interest. These figures supported the development of our further education model. To keep improving the quality of teaching, we also study the relationship between arousing students’ learning interest and the reasons behind, so as to have an even better design of learning activities. We found that among those who agreed on arousing learning interest by participating in the virtual activities, 84% have showed high rate of interest in the activities and 95% of them defined the activities as “fun”. This has proved the importance of fun and interest element of learning activity. Apart from the fun and interest factor, “Interactive” is another major important component. There are 82% of students, who gained learning interest, admitted that the activities are interactive. In summarization, “fun”, “interest” & “interactive” are the essential units on designing virtual learning activities, especially on arousing learning interest. These factors can be supported by our blended learning setting, which is one of the major strength comparing to traditional setting. Taken the “digital” advantage of having a high plasticity on content development to complement the physical and cost burdens in real life, we would have to be very careful on the content design too. In the survey, the factor(s) to be concerned on technology affecting the design are also put into focus. Since the background of the students from different departments varies on computer knowledge. Technology can then be a big burden on practising virtual learning environment in their study. In the survey finding, around 60% of resisted students are hindered by the long training time on adapting the use of Second Life and 75% of them are defeated by its high dependency on technology. At the same time, the figures showed that, in average, 65% of students who reflected poor interest in the activities faced problem in the training and technology dependency, especially on the slow response time due to the network lagging and unfamiliar with movement control technique, some students then feel annoyed and pressed repeatedly on the keyboard to navigate their avatars in Second Life and result in even serious delay. Therefore, we have published a general guide book and a series edition of guide book to fulfill different needs and backgrounds of students. We did also provided tailor-made training workshop for students and staffs to adapt the use of Second Life before they participate in the virtual learning process. According to the research of Stanford University, Lepper, M.R., & MaloVenne, T., W. divided the motivation on computer game into two categories: Individual and Interpersonal Motivations. With the found characteristic of motivation on computer game, it helps to explore and develop game based learning. For individual motivation, it included Challenge, Curiosity, Control and Fantasy; for interpersonal motivation, it included Cooperation, Competition and Recognition. Therefore, we tried to design our activities with elements to motivate our students to learn, so as to help them to gain knowledge effectively and provide them chances for practicing their skill and knowledge. To evaluate the effectiveness of the activities, we study the relationship between learning effectiveness and the motivation, according to the key factors found in designing learning activities. We found that those factors are very critical to students’ learning effectiveness. Among those who found the activities effective for their learning, around 90% of them agreed that their virtual learning experience are fun, interactive, providing them high rate of interest and able to arouse their learning interest. On technology aspect, similar result is found as on activities design. There are 70% of ineffective learners are trapped by high technology dependency and 50% discouraged by long and repeated training workshop. As the result, we have refine the content of our training workshop, including the employment of a better performance third party viewer for Second Life, add (and increase proportion of) fun and interactive content in the training workshop, as well as step-by-step exercise practice with the participants etc. Again, this finding proved the importance of activities design and the relationship between learning motivation and learning effectiveness, which is highly important for our further development of virtual learning for academic purpose. At the same time, technology problem is another issue needed attention. Beside arousing learning interest and increasing learning effectiveness, we would also like to help students to explore their potential ability. This is definitely a difficult goal to achieve, we have to do this step by step, and we choose to start from increasing their sense of belonging in the virtual world, as well as to affiliate students with their virtual role. Therefore, the virtual world is designed with PolyU traditional building style, and appearance & clothing modification are also included in the training workshop. To evaluate the successfulness of our design, we study the environment and avatar editing in relationship with the learning effectiveness. As mentioned, 70% of students approximately unanimous in support of the fruitfulness of realistic environment in strength the learning effectiveness. At the same time, over 60% of effective learners, who benefit from gaining knowledge and arousing interest, did pay effort in personalizing their avatar. While 40% of students who faced difficulties in modifying their avatar feel depression on their learning interest, this reflected the importance of “appearance & clothing modification” topics in training workshop. Though this is not directly reflecting their achievement in exploring their own potential, this verified the success of our first step. To get closer to our goal, we have to design another series of activities to help them to be more active in the virtual learning environment and allow them to explore and experience. In this stage, content development will become very critical and support from professionals and instructional designers are significant. In 2009/10 term 1, a Certificate Bearing Course "Using Virtual Worlds to teach and learn in PolyU” will be held by Core SL in cooperation with the EDC. A student handbook was published and distributed in several classes for assisting students to adapt to Second Life in their classes. Another teacher handbook is being edited which aims to provide teaching staff with an introduction to Second Life, while also providing an overview over teaching ideas for Second Life and a summary of the tools developed by the project for teachers to use in their teaching. Based on the successful use of the student handbook and the feedback gathered from teachers who used Second Life in their teaching, the teacher handbook should prove to be an effective and efficient way to attract teaching staff at PolyU into Second Life. A large number of courses were conducted over the past two academic years that incorporated Core SL within a blended learning approach. The project team developed and acquired numerous tools for easy use in teaching and made them available for booking by interested staff. Examples include virtual whiteboards and voting tools. The tools have been displayed in the Tower of Innovation on the virtual campus.